Every time I go to pack a suitcase, my intention is to pack lightly. I've always admired those people that don't check bags and roll a few t-shirts and a pair of jeans into a carryon and look amazing during their entire trip . . . you know, those same folks that limit their closet to 40 hangers? Well, I kinda sorta blew it this time on the whole packing lightly thing. I brought my FRENCH PRESS, for gosh sakes. 6 pairs of jeans (they are heavy in a suitcase). 7-8 dress-up outfits (I used one). 8 pairs of shoes (I used 2). It was insane, you guys. Coming home, it took hours to get the three suitcases to 50 pounds each, with most of the heavy stuff going in the carry-ons. I will never do THAT again. I am now 100% committed to PACKING LIGHTLY. Here's what REI has to say about this concept: "If you're not absolutely sure you'll need something, don't take it." I will say HANDS DOWN that every item I was unsure about, I didn't actually use on the trip. It took up valuable space and weight, and limited what I was able to BRING HOME. When I travel, I love picking up items along the way to bring home with me. Some items are gifts for family, others are gifts just for me, to remember something special about that one particular moment or place I was when I was traveling. So, never again. From this day forward, this girl will be known as a LIGHT PACKER. 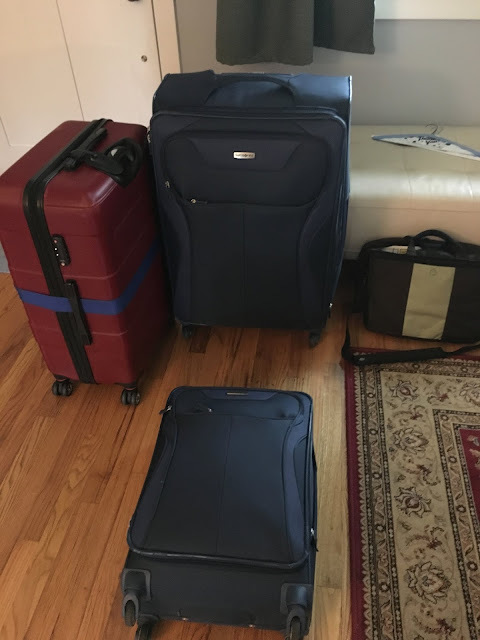 Look for a bullet point list on tomorrow's post on what I learned about packing on this fourth trip to Australia.